This run is always done combination with lower Silver Creek which makes for a very long day. Once you get past the falls on the lower section you have to cope with an incredibly tedious five mile class II section and then a mile of flat water across the reservoir. The whole run is about eleven miles, so plan for a very long day. There is only one mandatory portage if you put in below North Falls, so if you aren't up to running the rest of the falls don't paddle this section as you will only cause access problems for more capable paddlers. In order to reduce likelihood of a catastrophic accident the first time down you should make the two mile hike down the creek to Lower North Falls before you get in your boat in order to plan your portage route and pick lines over the falls. 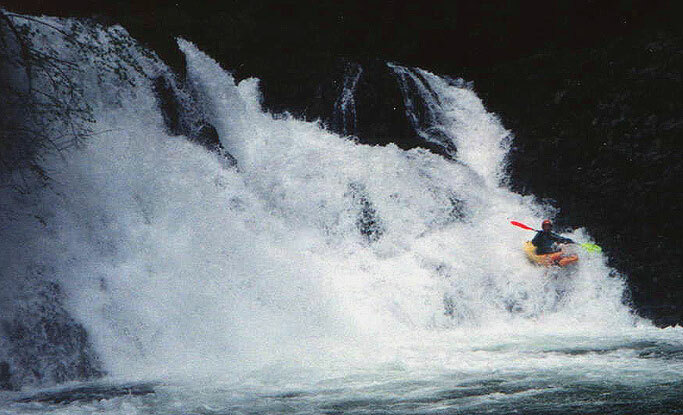 (Most paddlers who make this hike will choose to put in at the base of Lower North Falls for a more sane run down the lower section.) The ecosystem around the creek is very delicate and if hordes of kayakers start tromping all over the place this section will be closed to boating. In addition, this area is very popular with hikers, who are drawn by the spectacular waterfalls. Expect to see a crowd at each waterfall. When you first get to the park keep a low profile- avoid attracting the attention of the park service. The run begins with a half mile carry around the totally unrunnable 135 foot North Falls. This spectacular waterfall pours onto rocks, and the hike to the put in involves walking around behind the falls, which is pretty interesting. The creek is totally flat between waterfalls with at least one log portage, so don't expect any excitement between horizon lines. 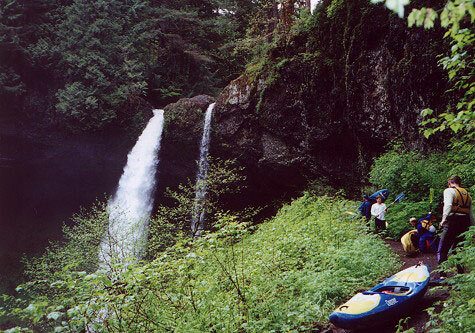 Put in at the base of North Falls and paddle about a mile to Twin Falls. This twenty five foot falls is class six everywhere but the far left side, and even that side has severe injury potential for paddlers who flip or collide with the jagged rock shelf halfway down. Scout on the left on the rock shelf, but once you are there you have few options but to run the falls. Mike Haley runs Twin Falls. Once below Twin Falls stay alert because just downstream is Middle North Falls. This falls is totally unrunnable, pouring 106 feet onto rocks. The portage is on the right on the hiking trail, but it would be very easy to get blown downstream over the falls. The current is fast and the eddies are few above the falls- at higher flows the area above this falls is extremely hazardous for even the best paddlers. This is the one place where you must ascend to the trail, but if you have picked your portage eddy ahead of time you will find a short rocky hike up to the trail that causes no damage to the creek bank. Below Middle North Falls paddlers encounter Drake Falls, a 20-30 foot double falls that is complicated by a couple of logs. The steep rock walls close in far upstream from this falls so once you are on the water you have no way to scout or portage- pick your lines ahead of time from the canyon wall far above. Ely threads the needle at Drake Falls, as seen from the observation deck on the canyon wall. There are two logs to avoid here. One is clearly visible and the other is almost hidden by the branch in the foreground. 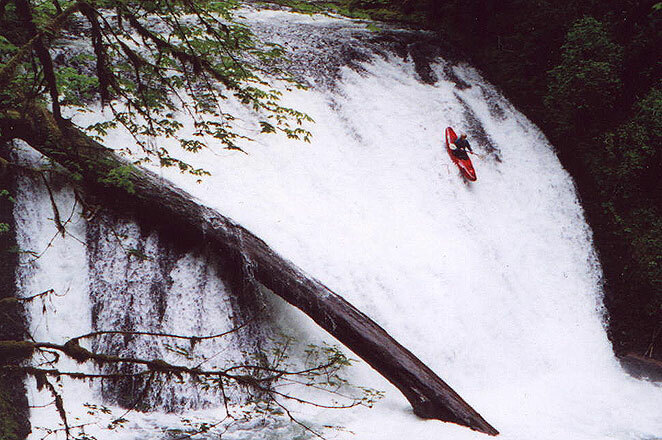 John Whaley runs Lower North Falls. The section below this run has more runnable falls and will be detailed in a separate trip report. FLOWS: This section is best when the Mollala at Canby is above 2000 cfs and the Clackamas at Three Lynx is above 3500 cfs. Because of the low altitude and small drainage of this creek, it has almost no snowmelt events in the spring; this creek is purely rainfed. Because of the wide nature of this creekbed and the ledge-type rapids it contains, it would not become appreciably more difficult at high flows short of flood (and maybe not even then, though it would likely become class V). 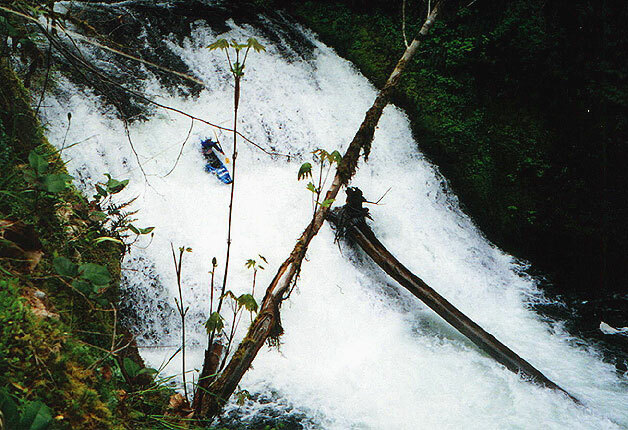 On the flip side, this run would be miserable at low flows; the ledges are so wide many of them would become unrunnable, and the five mile paddle out on the class II section would be miserable.